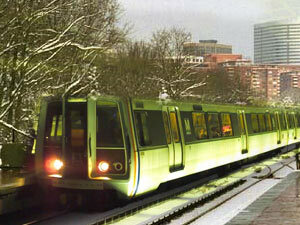 The city Transit Authority operates the Metro system, consisting of rail and buses operating through the city. Metrorail subway has stations at or near almost every tourist attraction. Five subway lines (red, orange, blue, green and yellow) known as the Metrorail cover the city and into the suburbs of Maryland and Virginia. The fare you pay depends on the zone you travel in. Keep an eye out for one day or weekend passes which offer not only discounted tickets but allow you to travel both on the rail and buses. A computerized fare card is used. The Metro rail operates from 0530-2400 from Monday to Thursday, 0530-0300 on Friday,0700-0300 on Saturday and 0700-2400 on Sunday. Route maps are posted at each station and inside each subway car.